The Ames scientists created a variant of the iron arsenide CaKFe4As4 by substituting in cobalt and nickel at precise locations. This slightly distorted the atomic arrangements, inducing the new magnetic order while retaining the material’s superconducting properties. Image: Ames Laboratory, US Department of Energy. Scientists at the US Department of Energy's Ames Laboratory have discovered a state of magnetism that may be the missing link in understanding the relationship between magnetism and unconventional superconductivity. The research, recently reported in a paper in Nature Quantum Materials, provides tantalizing new possibilities for attaining superconducting states in iron-based materials. "In the research of quantum materials, it's long been theorized that there are three types of magnetism associated with superconductivity," explained Paul Canfield, a senior scientist at Ames Laboratory and a distinguished professor of physics and astronomy at Iowa State University. "One type is very commonly found, another type is very limited and only found in rare situations, and this third type was unknown, until our discovery." The scientists suspected that the material they studied, the iron arsenide CaKFe4As4, was such a strong superconductor because there was an associated magnetic ordering hiding nearby. Creating a variant of the material by substituting in cobalt and nickel at precise locations, known as ‘doping’, slightly distorted the atomic arrangements, which induced the new magnetic order while retaining the material’s superconducting properties. "The resources of the national laboratories were essential for providing for the diversity of techniques needed to reveal this new magnetic state," said Canfield. "We've been able to stabilize it, it's robust, and now we're able study it. 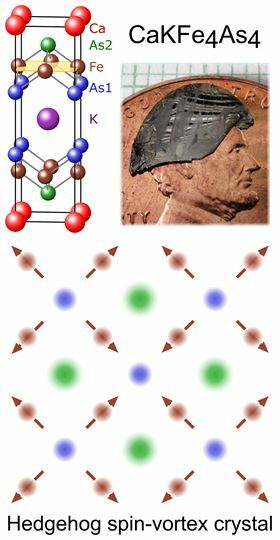 We think by understanding the three different types of magnetism that can give birth to iron-based superconductors, we'll have a better sense of the necessary ingredients for this kind of superconductivity."